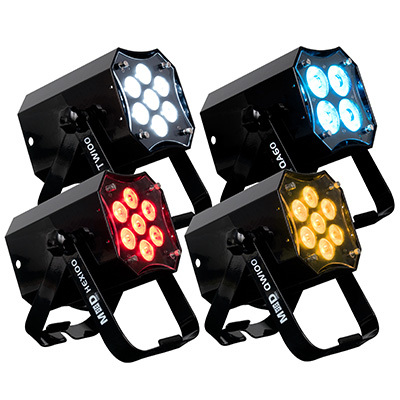 Capable of producing concise beams in a range of colours, the new ON-X offers a tight four-degree beam angle and is fitted with eight 3W LEDs (two red, two green, two blue, two white). Meanwhile, the 270-degree tilt movement of the unit’s heads ensures a cross-venue display of fast-moving, laser-like beams. 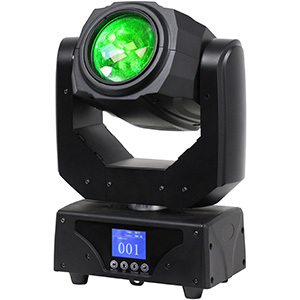 Mobile DJs can easily enhance these effects using the ON-X’s eight-zone chasing and the precise positioning enabled by its high-speed stepper motors, both of which let users fill the dance-floor with high-energy colour effects and sweeping movement. 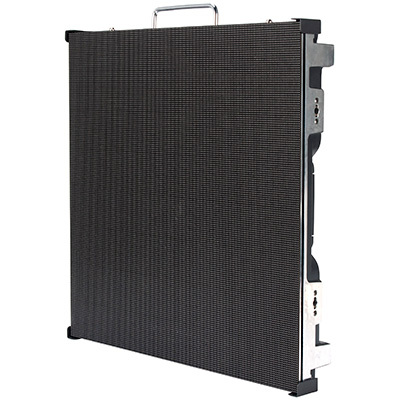 Compact (283 x 151 x 110mm) and lightweight (2.5kg), but with flexible movement, the ON-X provides mobile DJs with extensive coverage and an impressive overall effect, packing big-impact lighting into a portable unit. 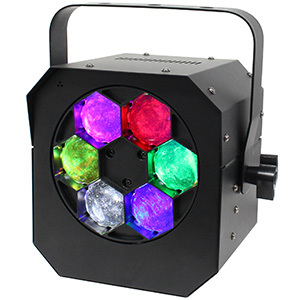 Furthermore, ADJ has ensured that the fixture can be mounted vertically or horizontally, allowing users to generate a varied and far-reaching lightshow that can also be enhanced using strobe and pulse effects, for when working with younger audiences and late-night events. 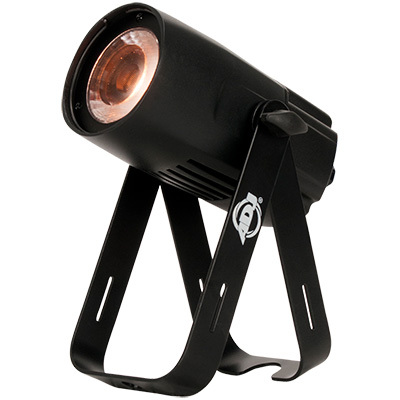 In terms of control, users have access to three operational modes: Show, Sound Active and DMX-Controlled, all of which can be selected from the unit’s four-button LED display and the latter of which offers six channel modes, letting mobile DJs tailor their lightshow to suit the requests of their clients and guests. 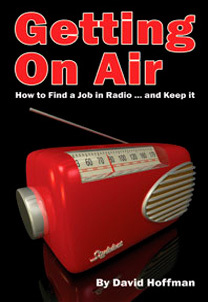 In the basic two-channel mode users can select Sound Active mode and various Show modes, as well as adjust the show speed and sound sensitivity. The ON-X’s nine-channel mode, meanwhile, allows users to adjust strobing settings, control RGBW and master dimming, fine-tune the tilt movement of both heads, and select special functions. Building on these nine channels, the 11-channel mode adds the Show/Sound Active settings found in the two-channel mode, while the 12-channel mode also grants access to a range of dimmer options. 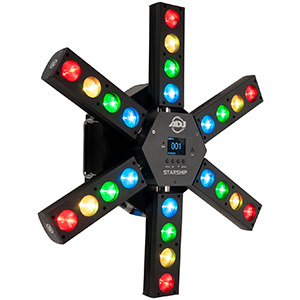 In-depth control over each individual LED colour for each head is offered in the ON-X’s 16-channel mode, while the fully blown 18-channel setting adds to this with control over fine tilt movement for each head. For those DJs that want to keep things simple, enjoying the impactful effects of the ON-X without the need for complex DMX programing, the Show and Sound Active modes benefit from a range of built-in programs that create something special for the audience. 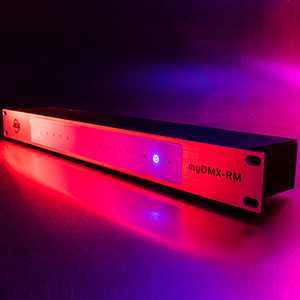 The ON-X is also compatible with the ADJ UC IR remote (sold separately), which grants control over the fixture’s basic features from a range of up to 9m. 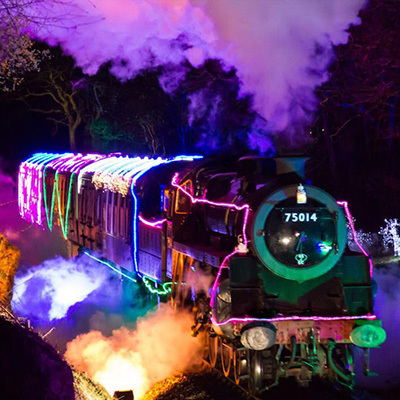 So, whether mobile DJs are positioned behind the booth, on stage or stood at the back of the venue, they can produce eye-catching lighting displays for their guests. With the recent arrival of ADJ’s forward-thinking Airstream IR App, the ON-X can also be operated from the user’s iOS device via infrared, providing users with wireless control over a number of features. 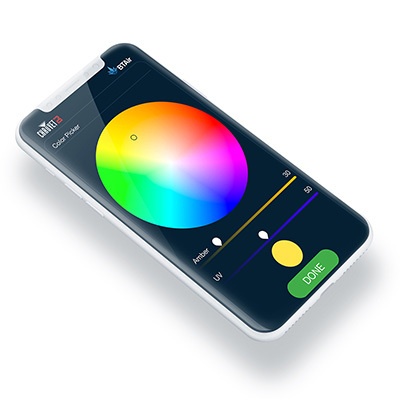 The Airstream IR control app can be downloaded from the App store for free and connects wirelessly with the fixture using the sensor (included with the ON-X) which slots into the headphone socket of the iOS device. Whether mobile DJs want to set the ON-X on the ground for upward-facing effects or mount it onto the wall for overhead displays of sweeping beams, the included mounting bracket makes a range of positions possible. Linking multiple ON-X effects is also easy thanks to its IEC in/out connections, which let users daisy-chain the power for up to 26 fixtures at 230V. 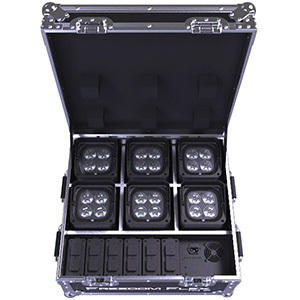 The ON-X is available now from ADJ USA and ADJ Europe.